Fighting Demons' was released worldwide last month, and we have received a lot of positive feedback from the press. Let it Rock magazine was the first rock website to review our album Fighting Demons. The review was written by celebrated rock journalist Dmitry Epstein. US music journalist Kevin Wierzbicki (Arizona) has reviewed Fighting Demons for the music website AntiMUSIC.com. Kevin Wierzbicki is notable for writing for many respected publications in the USA, including USA Today, AntiMusic.com, Desert Living Magazine and The Arizona Republic. 100% of the reviews that appear on AntiMUSIC are hand-picked, so if an artist or CD is reviewed here it is because the independent AntiMUSIC editorial team deemed it worthy of coverage. Therefore you can trust what they are writing! 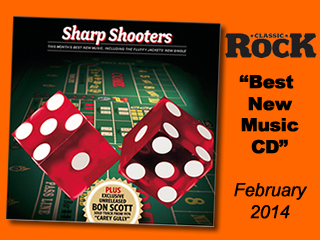 One of the largest and best music magazines on the planet is Classic Rock Magazine who included our first single in their February edition of the magazine #194, on a special "Sharp Shooters" Compilation CD, celebrating "the best music of the month". The CD was sent to their 60,000+ readers, so that was some really nice promotion for us. We also appeared on Classic Rock's online edition + social media platform Soundcloud, where our single currently has over 1800 plays. You can also read an interview with Classic Rock's Geoff Barton and listen to our first single here. Swedish online publication Zero Magazine also carried a review of the Fighting Demons album written by journalist Robert Ryttman. Blues Matters, UK's premier Blues magazine, has been in touch to confirm that a Fluffy Jackets album review is planned for forthcoming issue #78, out on the 30th May. 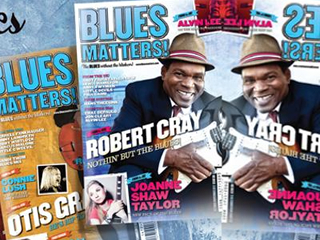 Blues Matters is a print publication, published 6 times per year and has a £5.00 cover price for each 132 page issue. You can purchase it at WHSmith, or SUBSCRIBE for the 6 issues, which cost £27.50 in the UK, or £45 in the rest of the world. It is also available as an App, if you are so inclined. Print reviews have also appeared in Breakout Magazine (Germany), Rock and Roll Magazine (Sweden), Record Collector (UK) and a number of other magazines. All have been in the positive, so thank you one and all for your support! PS: If you are working in the media and want to review the album, we are currently sending out FREE promotional CDs. Click HERE to get your FREE copy.